Make a beautiful statement in any brightly lit room. Discover which indoor trees are easy to please and choose the best one for your home from this list. Ficus plants grow tall, filling vertical space and drawing the eye up. One of these enchanting trees is all you need to make a large room feel more inviting. Large, leathery leaves make the Rubber Plant (shown at left) a popular house plant. 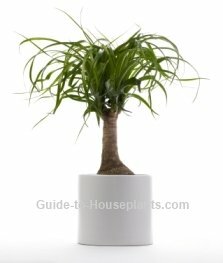 Put it in a brightly lit spot and you'll have wonderful success growing this bold accent tree. Even more magnificent (in my opinion) is the Fiddle Leaf Fig. 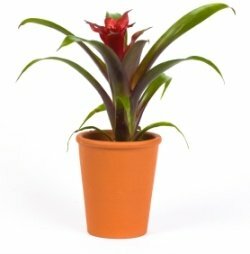 This stately beauty seems to be growing in popularity as an indoor tree. I'm seeing this shapely ficus everywhere -- interior decorators are giving this sculptural tree real estate on the pages of high-end decorating magazines. 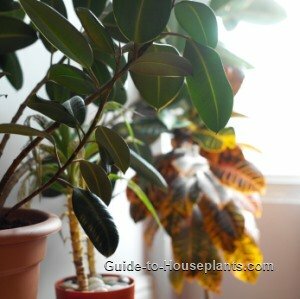 Among the most popular indoor ficus is the elegant Weeping Fig. Although it has a well-deserved reputation for dropping its leaves when it's moved around, be patient. This ficus will behave when it gets what it wants. Once you understand your ficus tree's nature, you'll find it is easy to grow. Its silvery trunk covered with sharp spines make the Madagascar Palm an unusual indoor tree. A tuft of long, narrow leaves grow only at the top, like a palm tree. However, it isn't really a palm but a semi-succulent. Put Madagascar Palm in front of a sunny window and you'll find it requires little attention to thrive. Another semi-succulent is the Ponytail Palm (shown here), a Mexican native that's easy to grow just about anywhere. Give it a place in the sun and you'll keep it healthy. Its bottle-shaped base stores water, so it won't mind if you forget to water it once in a while. What I like best about this tree are the long, strappy leaves that look like a pony's tail. Easy-to-please and eye-catching, what more could you ask? Palms are among the best-known house plants, but there are other tropical trees that will add dazzling drama to your home. Money Tree (shown at left) doesn't demand much attention at all. 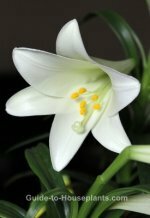 Put it in a bright location, water it regularly and you'll find it's easy to grow. Norfolk Island Pine is a giant in its native South Pacific habitat. Indoors, it will slowly reach about 6 ft (1.8 m) tall. This lush, soft evergreen adapts easily to most homes if you are willing to give it the humidity and bright light it craves. One of my favorites is the Ming Aralia. With a thick trunk and finely cut foliage, it gets even more attractive with age. And something else you'll love -- this Polynesian native isn't fussy at all. Give it warm sunshine and you'll enjoy this charming tree for many years. Why not punch up the color with showy blooms? Discover a variety of tropical flowering trees for your home.